Muscle Car Culture back in the 1960s-70s was king and kids old enough to walk themselves to school – and in those days that was young – were obsessed with all things muscle, American and big block engines. The Camaro, much like other muscle cars of its day ruled the road and was a regular sighting at not-so-legal street races. Today, while so much has changed, the incredible performance and grunt we associate with American engineering is alive and well. 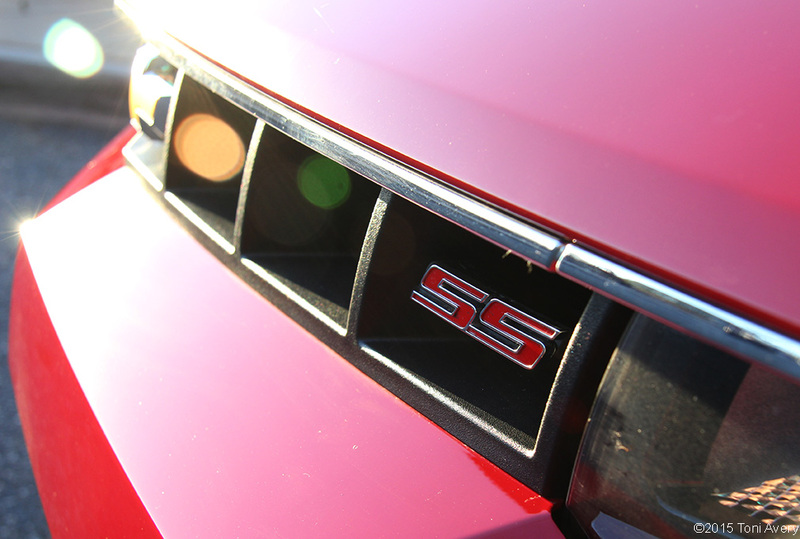 The 2015 Camaro SS 1LE is a prime example of automakers sticking to their muscle car roots while modernizing to only make it better. This Camaro is equipped with a 6.2 L V8 producing 426 HP @5900 RPM and 420 lb-ft of torque at 4600 RPM mated to a 6-speed manual transmission (standard in 1LE package). The Camaro performed better than I expected. 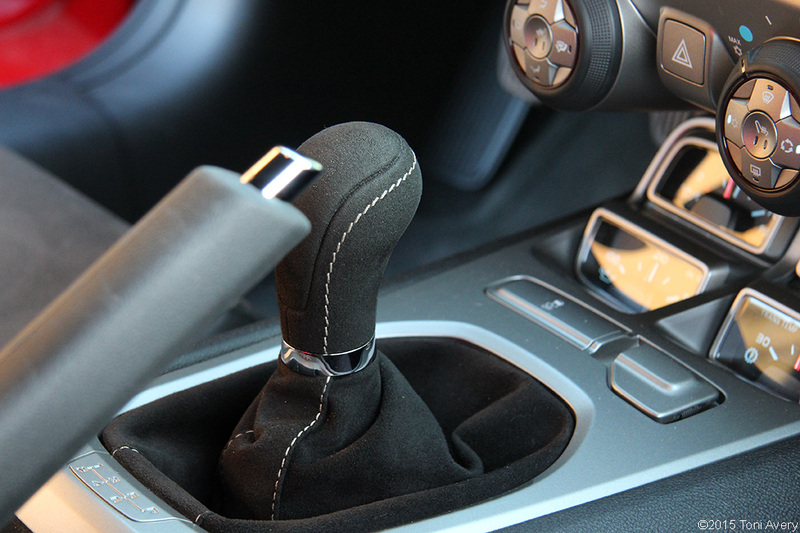 The handling is quick and precise, no matter what direction I gave it, the car delivered. While the ride quality was a bit rough, it was to be expected as this car is more aimed at the weekend track warrior than long distance GT driver. That being said, this Camaro is more than okay for someone who wants to make it his or her daily driver. 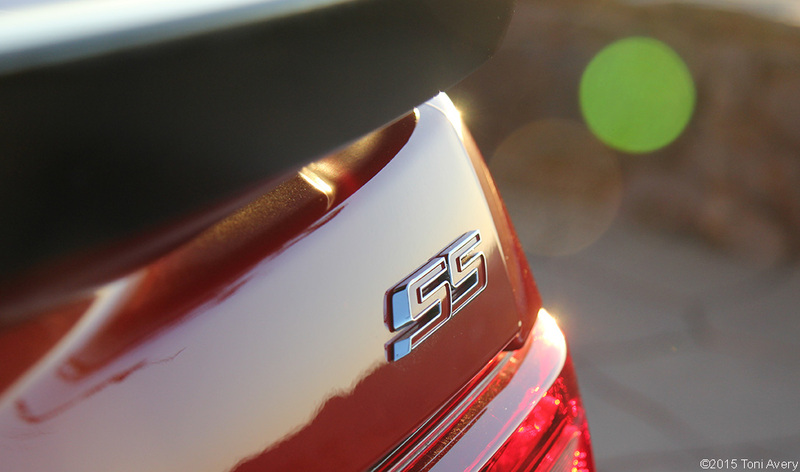 The optional 1LE package is responsible for some of those ride quality characteristics with a Suspension Ride and Handling Package. This package also includes a 3.91 axle ratio, further cementing its track ready nature. 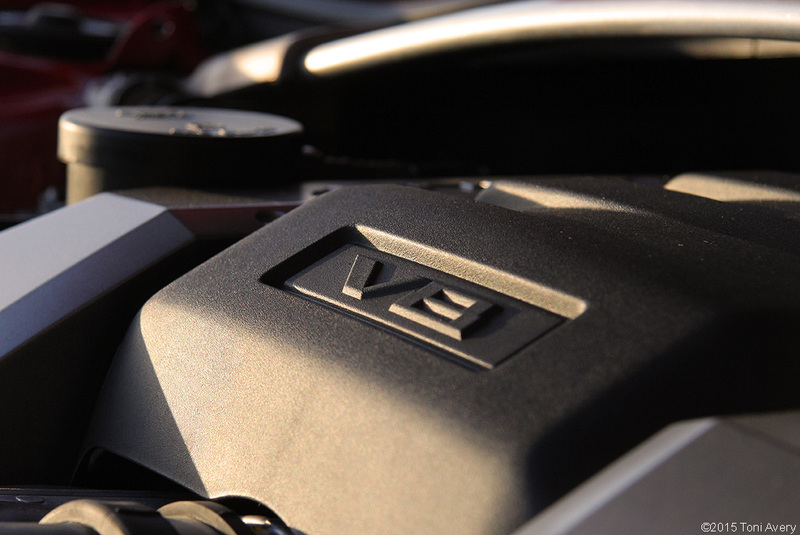 The engine bay also receives a nice upgrade thanks to the 1LE package; a strut tower brace, helping to add rigidity for better overall handling. While the transmission was good it wasn’t as smooth as its Ford Mustang GT competitor with the occasional popping out of gear (possibly due to over usage in testing) and operating the clutch smoothly took some getting used to. In terms of power, the Camaro isn’t lacking. It’s peak horsepower feels as though it comes in earlier than its stated 5900 RPM and it’s torque delivery feels like an ever-increasing flow of power. Assisting in slowing the Camaro from high speeds are four-wheel disc w/ ABS ventilated front and rear rotors, four-piston fixed Brembo aluminum front and rear calipers. These provided aggressive enough stopping power when braking in high-speed turns or even at a last second red light. The car’s biggest deficit affecting its performance is its excessive weight, topping out at 3908. That’s just about 200 pounds heavier than its Mustang GT Manual Fastback competitor. Unfortunately, it is noticeable when driving. And while gas mileage isn’t why you buy this car, I never got near the stated numbers. Driving the car like it should be driven, the best I got was 13.5 MPG. While the ride is a bit rough and the car is heavy this doesn’t mean the Camaro isn’t a great car. It is. Every time I started it, a great big smile stretched across my face, and every time I heard the incredible snap, crackle, pop of the option Performance Exhaust (a must add option that also adds about 5 HP!) I smiled even bigger. And taking it around my favorite set of twisties, I couldn’t think of anything else I’d rather be doing. It’s a great car in every way that matters. 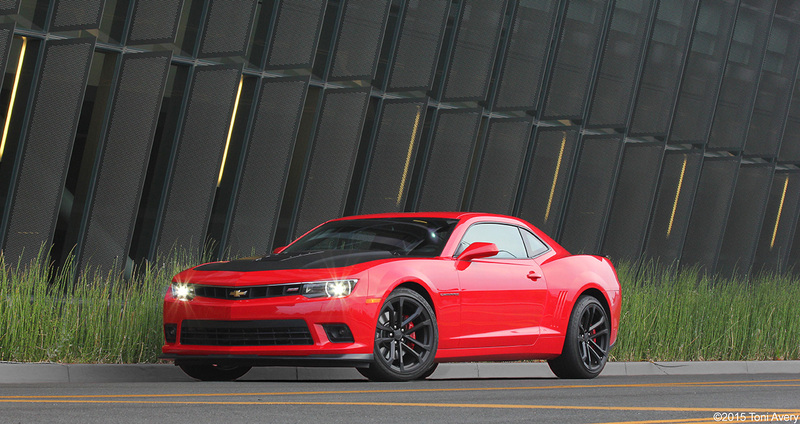 On the exterior, the Camaro is finished in Red Hot paint and features a Unique Rear Spoiler and 20” Aluminum Wheels (optional 1LE package), HID Headlamps with LED Halo Rings and Daytime Running Lamps (optional RS package), and a matte black hood with functional hood vents (optional 1LE package). 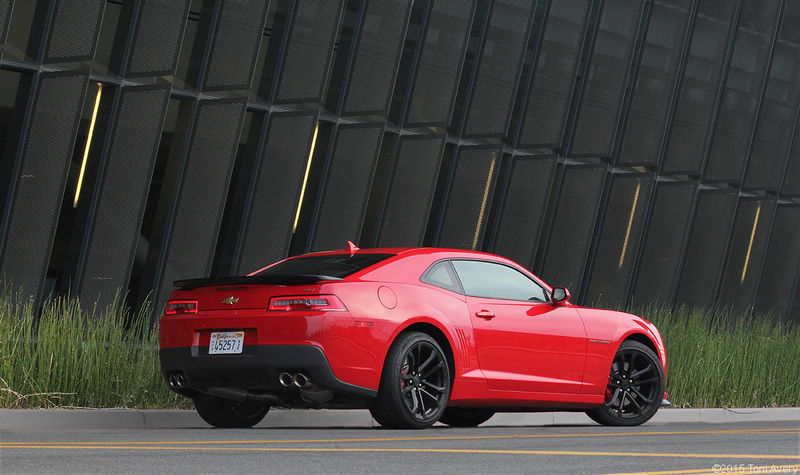 The outside of the Camaro is its best attribute, other than its great performance. The black and red color combination makes the car look even more aggressive than its exhaust note alone and the 20” wheels really fill in the wheel wells nicely. The car looks good from every angle. 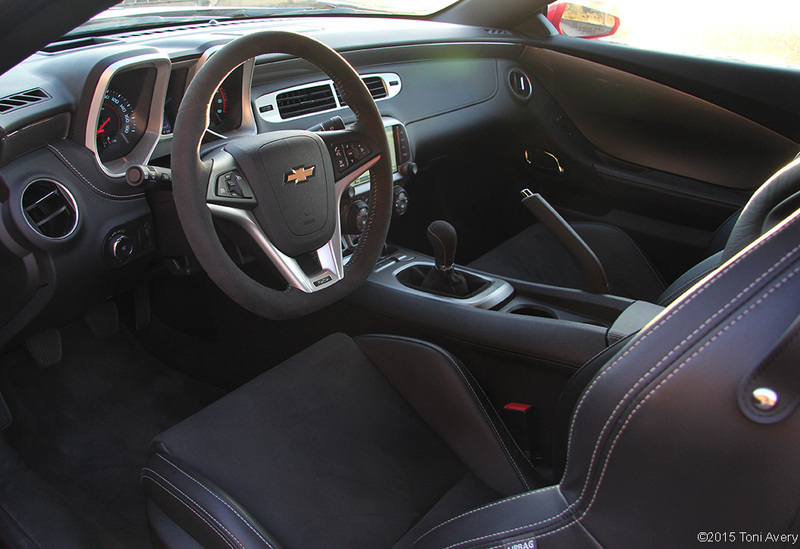 Inside the Camaro are Recaro Performance Seats (stand alone option), Navigation System (stand alone option), and a Suede shift knob and steering wheel (optional 1lE package). A common complaint about the interior of the Camaro is it’s lack of fine materials and just an overall cheap look. I don’t think the interior needs to be overly fancy especially when the driver will be focusing on the road and not the lack of colored stitching on the dash. 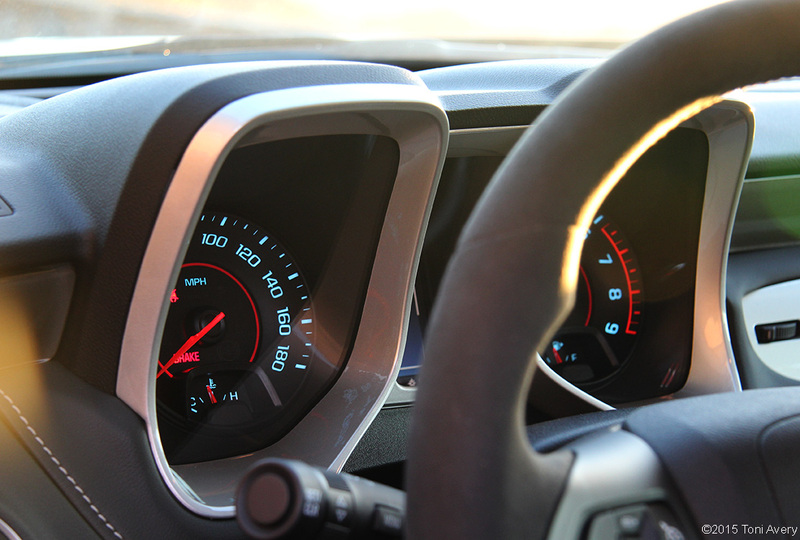 To put it simply, the interior is fine if you’re a driver and a little lacking if you’re a passenger. ©Ron Avery – this car is so track focused it even offers a Trans Temp gauge! 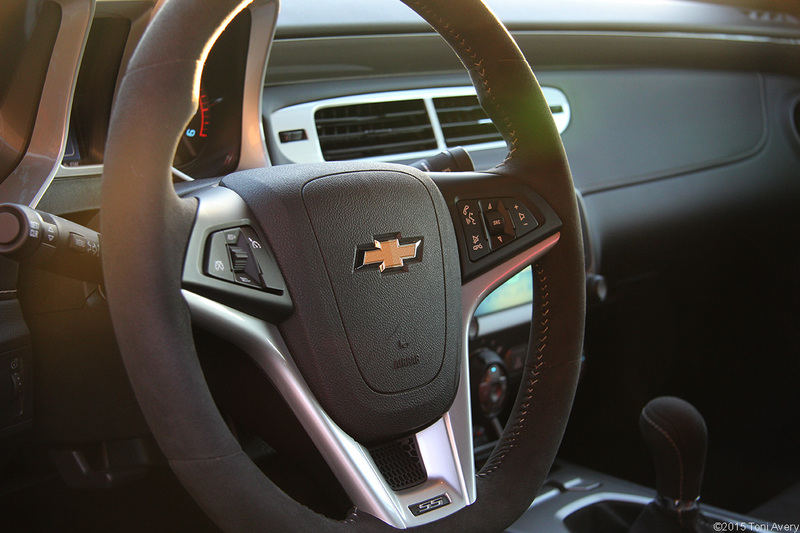 There are some cool elements like the suede steering wheel and shift knob, making the 1LE package even more of a must add on when spec’ing out your Camaro. The Recaro seats are also a great compliment to the 1LE package accents and are a must add option as well. The painted portions running across the front and sides of the car’s interior could do with some color, maybe even matching body color for some added pop. Something I can’t seem to get past is the infotainment system. It’s got to be one of the least intuitive and most confusing systems I’ve ever used. There’s a large dial on the head unit that reads volume and also has a power symbol. 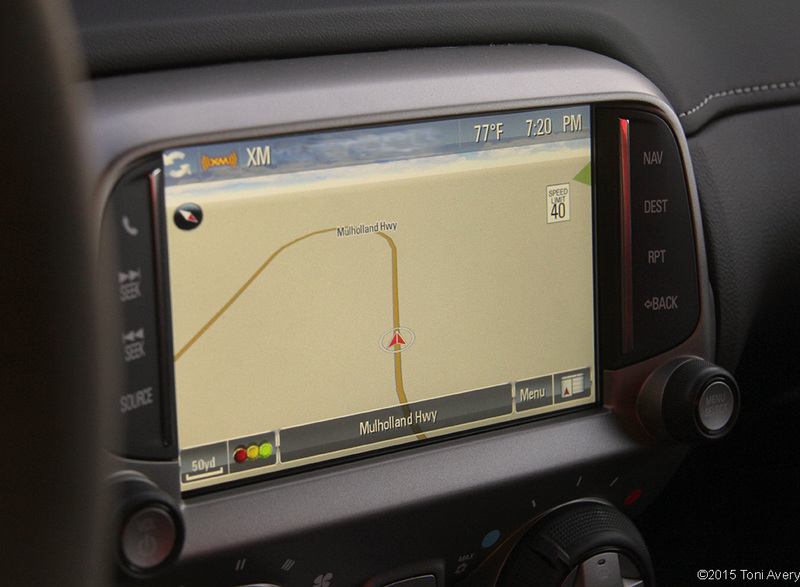 When pushed in, the volume mutes and the system turns itself off eliminating access to the radio and navigation system. Also, when navigating various menus I noticed that when I pressed one thing, another would pop up and so on. If you want to mute the volume use the steering wheel button to save some trouble. I’d actually skip the purchase on this option entirely and either use the nav within your phone over Bluetooth or get an aftermarket system. The Head-Up Display (standard) features a couple different views within the system. I stuck with the RPM and MPH display during my time with the car. The only issue I had with it was every time a commercial would come up on Satellite Radio, the Head-Up Display would show a description of the commercial, unless the volume was muted. To me, that’s very distracting. Space inside the car was a little tight, especially for people sitting in back. While trunk space was actually pretty generous. The rear seats also fold down for even more storage space. If no one’s sitting in the rear seats, space up front is actually pretty good for a car of its size. Im a current mustang owner and interested in also buying this 2015 Camaro. I’ve seen a lot of people complain of the poor visibility in camaros and wanted to ask you is it really that terrible? Is it anything mirror adjustments can’t fix? The claim is that the back side windows of the Camaro are entirely too small and produce blind spots when changing lanes and backing up. This confuses me a bit since I don’t recall depending on my side back windows that much and more so use my mirrors for changing lanes etc. Anyway, your opinion on this is greatly appreciated. Thanks. I purchased a 1LE as a daily driver and can honestly say that proper seat adjustment and mirror placement remove any blind spot concerns. I would ensure your car has the backup camera, however. The only tough bit is backing out from an angled parking spot, where you essentially have to look directly through the fat C-pillar and is outside the range of the rearview camera. I like the fact you get into the specs of car reviewing such as noticing the 1LE has a 3.91 rear end gear ratio rather than a standard 3.45. Great photography, videos that are easy to understand and listen to and in depth knowledge make your site an easy choice when wanting to purchase a car.